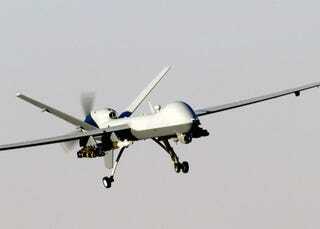 An MQ-9 Reaper drone's fail-safe programming failed and it rushed through Afghanistan's airspace on Sunday. The US Air Force simply responded by sending a manned plane to shoot it down. Turns out this isn't all that uncommon. Apparently the pilots of an unmanned, but armed, MQ-9 Reaper drone lost control of the UAV a few days ago. The resulting manned mission to take it down was mounted almost immediately and ended successfully before the drone reached the edges of Afghanistan's airspace. I wonder what would've happened if the Reaper hadn't been shot down. It is typically used for "hunter-killer" missions and targets enemies on the ground. Would it continue a mission like that without operator input?